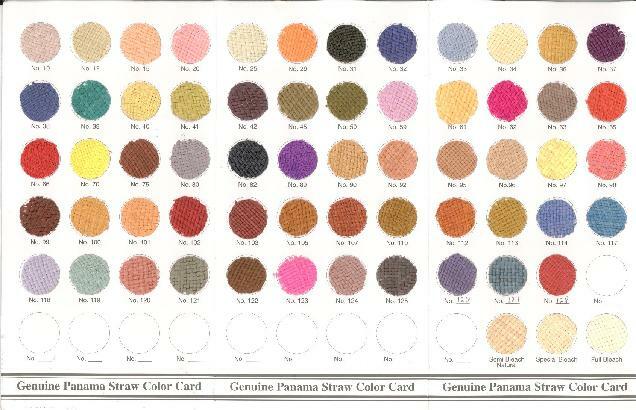 For color selection, please refer to our color card. World hat company will hand-weave Panama hats to order, we can create new weaves or dye the hats in any color, we offer over 70 different colors. Our products range from regularCuenca or Brisa to the finest Montecristis. We are also importers and wholesalers of all types of straw and cotton hats. World Hat Company can send your merchandise anywhre in the U.S.A. or the world. We ensure that all the products we carry meet our high expectations for quality, and that we provide the best pricing and on time delivery. The weaving of Panama Hats has been known ever since the Spanish conquest in the 16th century. Natives from the Ecuadorian province of Manabi have been weaving hats with Paja Toquilla straw for many years. Many years later the art of weaving was taught in Cuenca expanding very quickly throughout the provinces of Azuay and Ca�ar, now the largest centres of hat production in Ecuador. At first they were sold locally within Ecuador, it was many years later before they actually started to export their hats. Buyers shipped them to Panama during the building of the Panama Canal, where they were worn by the workers for protection from the sun. Since then the hats became known throughout the world as the Panama hat. A new generation dedicated entirely to the process of developing new styles, colors and quality, so that they could offer the finest of what is a true work of art based upon Ecuadorian folklore. Today we are even more aware of the importance of protecting ourselves from the harmful effects of the sun and the Panama hat is an elegant solution. Our company has strived for three generations to achieve the perfect combination of nature, tradition, experience and craftsmanship. As a result we proudly offer now the finest and most exclusive Panama Hats.